Nurses at War remembers the brave nursing sisters of the Queen Alexandra’s Imperial Military Nursing Service (QAIMNS), known with admiration by their grateful patients as the "Q.A.s". These dedicated women faced danger and sometimes death to care for wounded servicemen during the Second World War. They worked tirelessly in the field – their lives constantly at risk, but throughout they showed courage, spirit and even humour. Among tales of fear and heartbreak, there are also many moments of compassion and hope. The inspiring nursing sisters worked in the most dangerous places of action during World War Two - including Dunkirk, Malta, Hong Kong and El Alamein. They encountered death and disease on an unprecedented scale, suffered harsh imprisonment by the Japanese, and were bombed while on board hospital ships and trains. But wherever they found themselves, the sisters continued to carry out their duties with professionalism and a plucky determination. 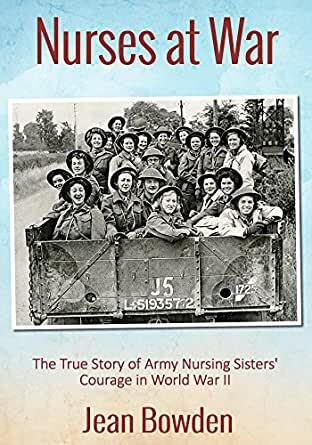 First published to great success and acclaim in 1959 as Grey Touched with Scarlet, this book has been written based on the first-hand accounts of the army nursing sisters. Jean Bowden also writes as Tessa Barclay. Her popular family sagas are now also available from Amazon. another poorly written account. there was no flow flow to this or organization of events. Really disappointed. Great book. I thoroughly enjoyed it. 5.0 out of 5 starsNurses at war. Bowden tells the story of the QA's during World War II. They served in all theaters of the war and endured all types of hardships. A must read! I am a surgical nurse and find these type of books inspiring. When I feel I cannot go on during a long day of surgery I think of those who went before me into battle and did what I have to do.